Carl Stockdale was a familiar face in dozens of westerns, usually playing the local law or friendly rancher. Stockdale’s total film output exceeds 300, counting his many appearances in early Broncho Billy one-reelers. Born William Carlton Stockdale February 19, 1874, in Worthington, MN, to William S. Stockdale of Pennsylvania (a “commercial traveler” dealing in groceries) and Melissa Shremaker of Ohio, young Carl received his early education in Minnesota, then graduated from the University of North Dakota. He spent some 15 years traveling with various stock companies in the East. Married in 1908 to a lady named Clara, a theatrical actress from Illinois, by 1910 the couple was living and working in Spokane, WA, and later the Alcazar Theatre in San Francisco. In 1913 he joined G. M. Anderson, eventually appearing in over 55 Broncho Billy one-reelers released by Essanay through 1915. The tall (5' 11½"), slender (152 lbs.) young actor then graduated to full-length features including roles in Douglas Fairbanks’ “The Americano” (‘16), “Intolerance” (‘16) and “Oliver Twist” (‘16). In 1918-‘19 he supported cowboy star William Russell in several American Film Co. productions such as “When a Man Rides Alone”. He also spent time in silent westerns supporting Franklyn Farnum, William Duncan, Jack Gardner, Ken Maynard and Buck Jones. 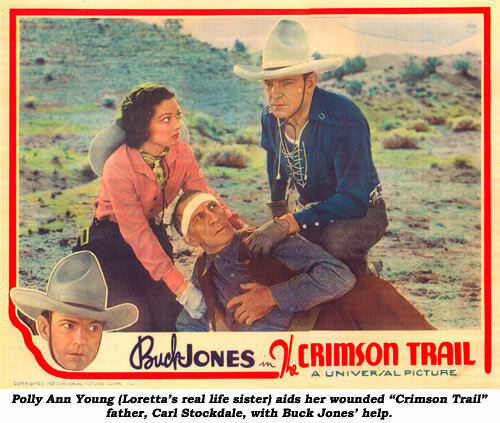 His voice made an easy transition to sound and, after bit roles in “Billy the Kid” (‘30) and “Cimarron” (‘31), he once again joined Buck Jones for Carl’s first sound B-westerns (“Thrill Hunter” [‘33], “Rocky Rhodes” [‘34], “Ivory Handled Gun” [‘35], “Crimson Trail” [‘35]). 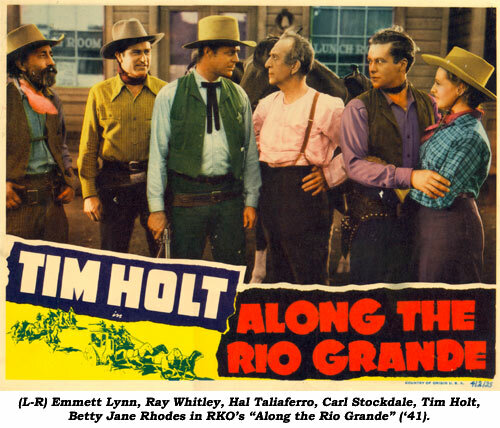 His other sound westerns in the ‘30s and ‘40s starred George O’Brien, Tim McCoy, Gene Autry, Tom Keene, Smith Ballew, Ken Maynard, Bob Baker, Charles Starrett, Bill Elliott and Tim Holt. Carl’s younger brother (by 3 years), Frank, also did some acting. His only credited role seems to be in “Gold Rush” (‘25). 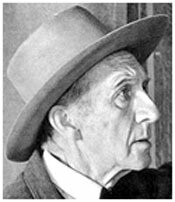 Incidentally, Carl Stockdale was a very close friend of actress Mary Miles Minter’s mother, Charlotte Shelby, and testified on the witness stand he was with Mrs. Shelby when movie director William Desmond Taylor was murdered in 1922 therefore Charlotte could not have killed him as she was accused. Stockdale concluded he suspected Taylor’s one-time chauffeur of the murder. Minter and Taylor were having an affair and it was speculated Minter’s possessive mother, Shelby, might have killed Taylor. The case was never solved. According to research by Mark Alfieri, the book CAST OF KILLERS by Sidney D. Kirkpatrick (Dutton, 1986) came out in the mid-1980’s. The author finalized and published certain research previously completed by director King Vidor (in the 1970’s) into the William Desmond Taylor murder. In researching the murder, Kirkpatrick (and Vidor) discusses a series of lawsuits filed by Charlotte Shelby against her former business manager. Charlotte claimed funds were embezzled. The business manager claimed the missing funds were actually payoffs made to several Los Angeles district attorneys (‘20s and ‘30s) and to Carl Stockdale over several years to hide Charlotte’s culpability for Taylor’s murder. Stockdale received $200 per month for years in exchange for an alibi he provided to Charlotte the night of Taylor’s murder. Stockdale evidently lived in Charlotte’s house for a period of time as well, prior to its sale in the late ‘20s.